Eurocom is launching the most powerful Mobile Workstation ever made. Equipped with the most powerful Intel Processors up to Intel Core i7 6700K accompanied by 64 GB DDR4 memory, 5 TB Solid State storage and professional graphics up to NVIDIA Quadro M5000M powering an exquisite 17.3” 4K Ultra HD display. 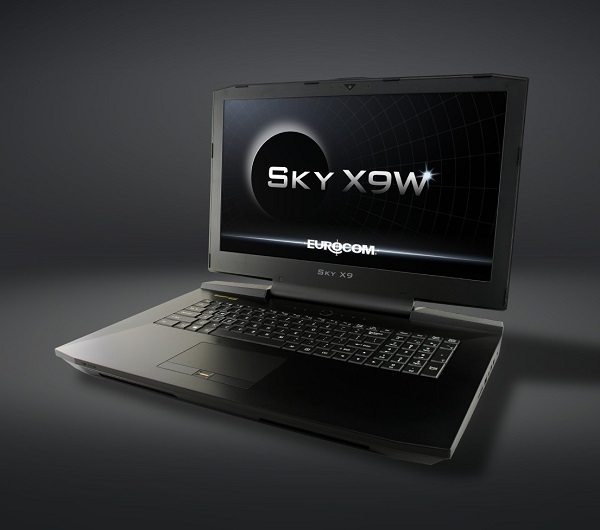 The EUROCOM Sky X9W is the most powerful "Mobile Workstation" ever made. It is a completely user-upgradeable, fully customizable and extremely flexible design, allowing the Sky X9W to be configured with a variety of options including various Quadro GPUs and high performance desktop socket processors. The EUROCOM Sky X9W has mission critical reliability and super computer performance with quality to last and upgradeability to improve capability along the way. “Take desktop workstation capability and performance with you, on the road, with the EUROCOM Sky X9. Desktop Intel processors and high performance NVIDIA Quadro graphics combine to provide all the performance you will ever need.” Mark Bialic, Eurocom President. Eurocom recognizes our customers are using Mobile Workstation for mission critical applications and projects that are extremely important, because of this we equipped the Sky X9W with Trusted Platform 2.0 module, Fingerprint and Kensington lock to guard the data that our users value. RAID 1 is offered to protect user’s data by making an exact copy on a secondary hard drive.